Born in Heidelberg,Germany, on 9 November 1907, Franz Holford moved to Australia in the late 1930s after having studied both in Paris and at Oxford University with Alfred Cortot (piano), Jack Westrip, Hans Bekker and Sir Hamilton Harty. 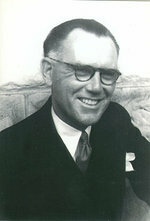 His interest in the development of Australian music led Franz to found the Australian Journal of Music, The Canon, in 1948 - continuing as editor through its seventeen years of publication. He gained further involvement in Australian music through his role as editor for the music publishing house J Albert & Son. Franz Holford died in Brisbane on December 5th, 1994. Book: When soft voices die : Franz Holford remembered / by Phillip Wilcher.